Hey hey is a classic 12 bar blues song released by Eric Clapton on his 1992 Unplugged album. It is a great song to learn, as you'll really advance your fingerpicking technique and your timing, and not forgetting the fact that your friends will be amazed that you can play this song. Our video guitar lesson on Hey Hey will teach you everything you'll need to be able to play along with the original recording. First you'll be learning the main riffs of the song, which are divided into 6 parts in this tutorial. Take your time with each, and watch the rhythm, it's a bit difficult to play at first (but will become second nature with enough practice). Also, learning when to apply palm muting to just the right strings might take some time to get used to as well. Once you learn the main riffs to Hey Hey with our guitar tutorial, your fingerpicking technique will have improved by at least 10 fold. It is a tough one, but as you know, practice makes perfect. Once you learn the main riffs to Hey Hey, you'll learn the chord progression Eric Clapton plays during the verse. 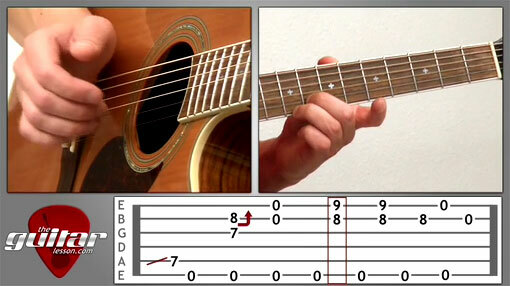 It is a classic 12 bar blues progression in the key of E, which you will learn rather quickly. As you know, the 12 bar blues is always made up of just 3 chords played in a specific progression, which you'll learn in the lesson. Hey Hey was originally recorded by Big Bill Broonzy, an American blues singer, songwriter and guitarist who shaped early blues music during the first half of the 20th century. Early blues had a large influence on Eric Clapton as well, hence his cover of Hey Hey. This guitar lesson is on Eric Clapton's version, but make sure you listen to the original Broonzy version as well. Sorry, but you've reached a premium content area. The download of the Hey Hey tablature file is only available to premium members. Sorry, the same goes for the backing track. To download the backing track to Hey Hey, please log in and revisit this page.